Finding free time for a dog often involves adjusting your training schedule… and fighting the guilt. It’s the guilt felling one gets when keeping a dog in a small cage at night, while traveling - or even if it is in a kennel run all day - and it can be hard to cope with. This feeling of guilt only goes one way because the dog is just happy to see you - no matter what your feelings are. The dog does not feel guilty knowing that you feel guilty - they just use that to their advantage by making you feel more guilty. Consider what is happening in the dog’s mind when he is in his travel cage or kennel at home versus what is happening when he is loose in a vehicle or the yard. The kenneled dog soon learns that you control the "in" and "out" pass. You control his food. You control his walks. You control his training sessions. You control his time for having fun and generally, control his life. The dog that is loose in the vehicle or yard soon learns that he controls his free time. He controls his walks. He controls his training time. He controls his fun time and generally, he controls his own life. Is this what you want in your hunting buddy? The key word here is "control". When training a dog, you need to determine who do you want to have controlling your dog... you or the dog? Any time that you spend with the dog will be valuable time - if the pup knows you control the situation. They look forward to the sessions with you - or anyone who works with them. Maybe you think that "control" means to be too strict on them. That is not the case. Control means when you give a command, you can enforce it and the dog obeys it. You can give the command to let the dog have some play time by releasing him from the "hup" or "stay" commands. We have four or five dogs that regularly come down to the house each evening with us. At the end of the day, those dogs come out of the buildings, all put on a "hup" by the golf cart, then Sophie runs them around the field with the golf cart. To them, this is playtime, but we have told them that this is OK to do. We allow them this exercise and the run with the golf cart. They are just happy to be with us. "When training a dog, you need to determine who do you want to have controlling your dog... you or the dog?" Control is the key. Establish that early in the life of the dog and dissipate your guilt feelings into good times every time you are with your dog. Just as important as control is obedience. Obedience work is boring and dull, but is a necessary task. I am asked many times after a weekly field session, "What can I be working on until next Saturday?" My answer is always to be working on obedience. Sure, it is not as fun as taking a walk with your pup into a field and letting him run around, throw a few bumpers for retrieves and maybe even a frozen bird or two. But the more we work on obedience, the better the dog becomes. Obedience work is often the dull, mundane part of dog training that no one wants to take the time to do. Often times, I need to remind myself of the constant repetition that I need to do with obedience work with the dogs. This is not very exciting to watch and an owner wants to see his dog flush birds, retrieve and act like it is hunting - but the obedience work is the foundation. 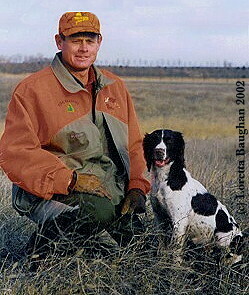 "Never miss an opportunity to train your dog," a quote from Mr. R.E. French, is so true with obedience work. Obedience can be done anywhere. Whenever you are around your dog in the house, work a little bit on the "heel" command, "hup", "stay" and "come". 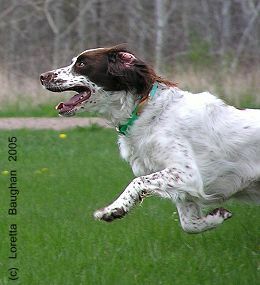 Inside the house - or outside in the yard - spend a few minutes doing the "heel" command, "hup" and "stay". If you feel you want to take a walk with your dog in the field or down the block, get out the lead rope and work on the "heel" command. Start with heel for twenty yards or so, hup the dog, back away from the dog, walk up to him, then grab the lead again and command "heel" as you walk off, again. Vary your little walking sessions with the heel, hup and sometimes backing away from the dog and calling him to you - while other times, walking back to him and taking off on the heel, again. By spending just fifteen minutes with the dog outside in a session like this, you will see progress in a few short days.